Some curries are experimental but become a favourite from the first time they are cooked. 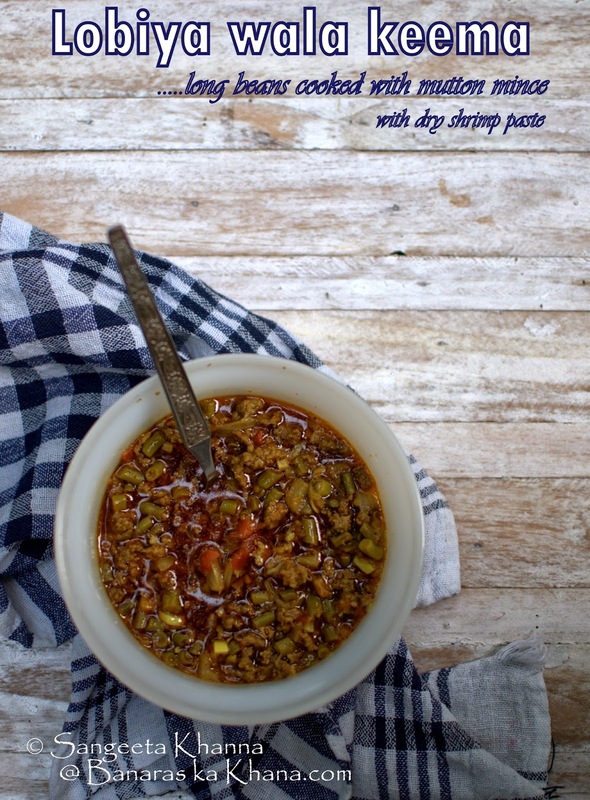 This lobiya wala keema is one of those recipes that I cooked on a whim one day and have repeated a few times already. 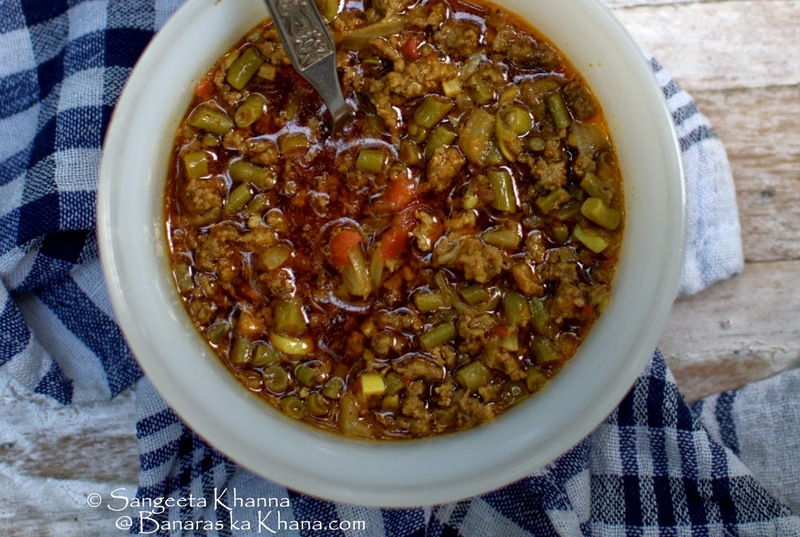 I do cook keema curry with added vegetables quite a lot and many keema recipes on this blog would not disappoint you in this regard but this time I wanted to get some extra flavours and I did a trick. I make my own shrimp paste and have cooked it earlier with long beans. A freshly made shrimp paste recipe (sambal belacan) is there on the healthfood blog. This time I just made a paste with ginger and garlic and used the whole paste in this curry. I know I will be repeating this way of using dry shrimps for sure. Make a paste of garlic, ginger and shrimp and keep aside. Heat oil in a deep thick base kadhai and tip in the cumin seeds and tejpatta. Add the chopped onions and fry till pinkish brown. Now add the shrimp paste and the chopped lobiya both. Add salt and powdered spices as well and keep stirring to mix well as the mixture cooks and gets aromatic. It takes about 5-7 minutes. Now add the keema and keep stirring to break the keema and cook till it starts releasing fat. Add the fresh tomato paste and cook for about 5 minutes more, stirring all the while. Now add a cup of water and cover the kadhai. Let the curry simmer on low flame for about 25 minutes. Serve hot. There is no need to garnish this curry with any herbs as the aroma of shrimp paste cooked with the spicy gravy id really something you wouldn't want to mask. But add a few springs of coriander greens if you like. Some chopped green chillies and minced or julienne ginger will be good if you want the curry to be hot, especially if you are having it with khameeri roti. The flavours are very meaty, very rich umami hints and the lobiya somehow seems to add to the flavours too. I think I would like this keema curry with cauliflower and may be with cabbage as well. I have more dry shrimps as I had ordered loads of ti from Anjali Koli of Annaparabramha. And I intend to use it well. Let me try and let you know. Or you try and tell me what way you liked it.